The project – which broke ground in May, 2009 – marked the seventh expansion completed at the resort since it opened as a 30,000 square-foot bingo hall in 1993. It created more than 200 jobs and brings the total tribal employment to more than 2,000, making the tribe North Idaho’s largest employer. 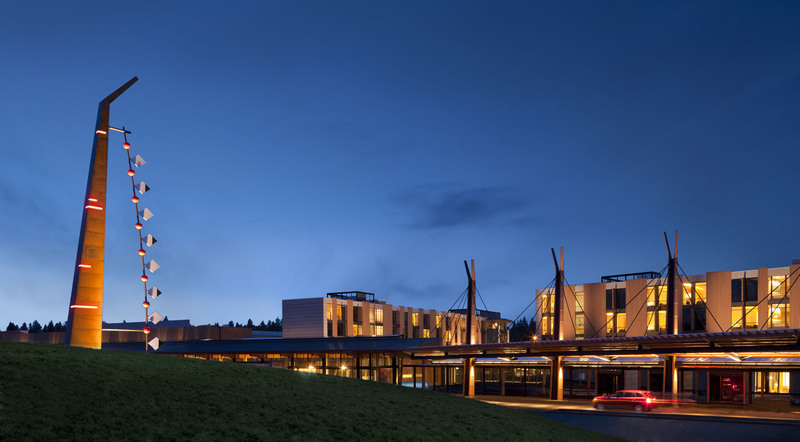 “The amenities we added have dramatically expanded the resort and the overall experience our guests can expect here,” added Dave LaSarte-Meeks, Chief Executive Officer of the Coeur d’Alene Casino Resort, which is located in the Idaho panhandle, within an easy, scenic drive from eastern Washington’s Spokane Airport. 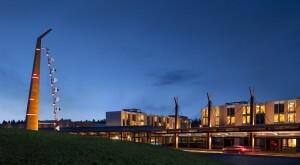 • Nearly 100 upscale hotel rooms in two wings, overlooking Circling Raven, the native wetlands and rolling Palouse hills. The open, airy rooms feature the latest technology, built-in cabinetry, dramatic 10-foot doors and floor-to-ceiling windows. • A gourmet steakhouse called Ts’elusm (pronounced “T-sell-OOS-m”), which means “stand before the fire.” Guests can watch as chefs grill the finest dry-aged prime and Kobe beef over an open-wood fire. With a vast wine list, Ts’elusm offers a leisurely atmosphere with views of the natural grasses in the meadow outside. • A 15,000 square-foot, full-service spa called Ssakwa’q’n (pronounced “SOCK-wah-kin”), which describes a small, refreshing lake on a mountain top. Inspired by the tribe’s rich connection to nature and tradition, Ssakwa’q’n offers an all-season, open-air pool, Vichy shower, cedar saunas, 10 treatment rooms and a tea lounge. • A 10-acre “Front Yard” that will serve as an outdoor amphitheater for concerts and other outdoor events as well as provide a location for a year-round fire circle. • A sports bar and café called “Yap kee num” (“a gathering place”), offering a vast selection of beers, wines and spirits and a pub-style menu. Outdoor seating is available alongside the new sweeping “front yard” area. Stay-and-play packages at Coeur d’Alene Casino Resort Hotel and Circling Raven are now available and start at $199, based on double occupancy. This price includes a standard room and golf for two at Circling Raven, a Gene Bates design.